It’s 2014, and you know what that means, time to update our list of strange geek-related Amazon items currently available. 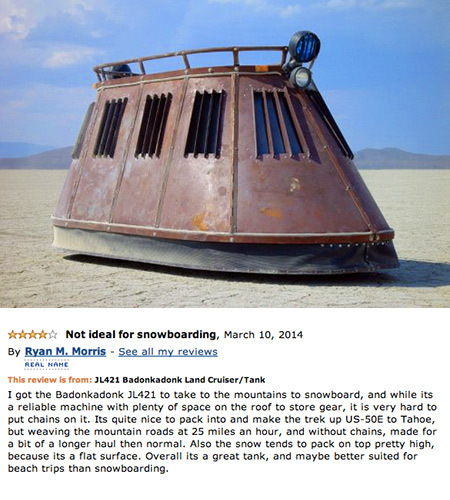 For starters, the $19,999.95 Bandonkadonk Land Tank / Cruiser above is still for sale. The interior is fully carpeted and cozy, with accent lighting and room for up to five people. A 400 watt premium sound system with PA is mounted to project sound both into the cabin and outward from behind the windows. Continue reading for more. The UFO-02 Detector supposedly continually monitors its surrounding area for any magnetic and electromagnetic anomalies. Technically speaking, the company wants us to believe that the device has a magnetometer interfaced with microcontroller for detecting magnetic anomalies. The UFO Detector is designed to sense these electromagnetic disturbances and signal their detection flashing 16 LED’s simultaneously and beeping. 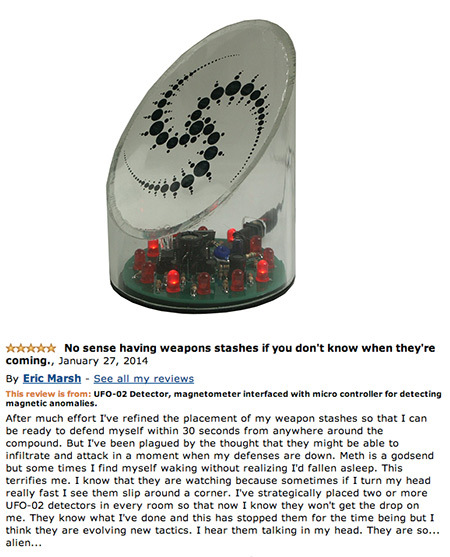 Product page. 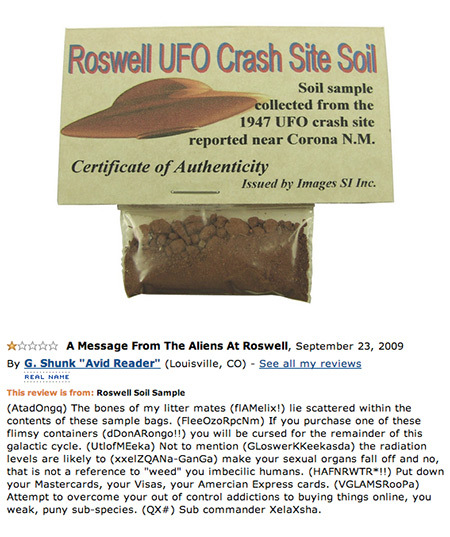 This Roswell Soil Sample was purportedly collected from the famous 1947 UFO crash site near Corona New Mexico. The small plastic bag containing the soil sample comes complete with a Certificate of Authenticity card from Images SI Inc. On July 8, 1947, the Roswell Army Air Field (RAAF) issued a press release that it had recovered remains of a crashed “flying disc” from a ranch near Corona NM. Product page. A fresh whole rabbit is actually being offered on Amazon, but it’ll cost you a pretty penny, $59.90 + $18.90 shipping to be exact. According to the seller, “Rabbit meat is lightly flavored and has a nutty aftertaste that is unique to this animal. It is a low fat meat, low in cholesterol, and a nutritious source of proteins. Excellent with a mustard sauce or stewed slowly with onions.” Product page. 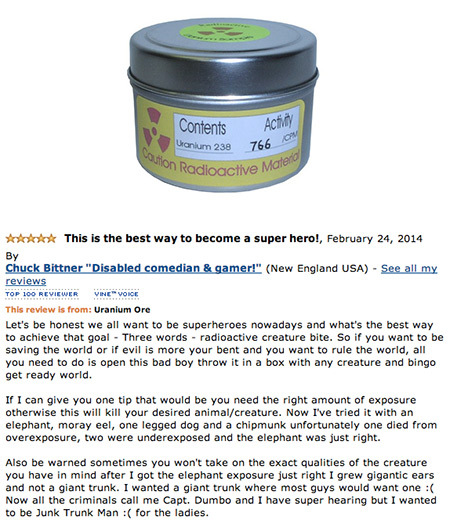 Uranium ore is apparently easier to obtain than once thought. This particular sample was created to test Geiger Counters, and its activity level includes all radiation types: alpha, beta and gamma. Counts Per Minute (CPM) activity rate listed on the label is determined using a GCA-07W Digital Geiger Counter with an NRC certification. Product page. 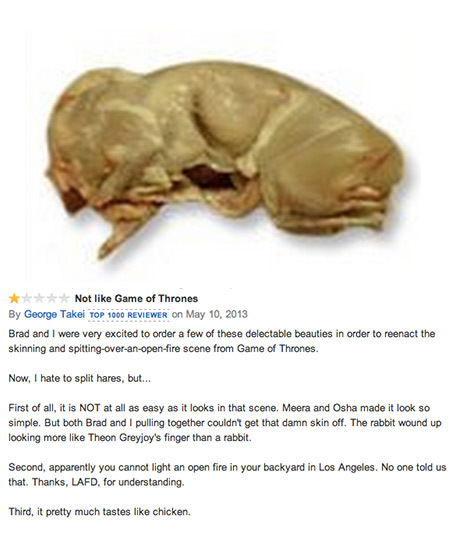 The JL421 Badonkadonk isn’t some Star Wars prop, but an actual item that you can buy on Amazon. Designed with versatility in mind, the Donk can transport cargo or a crew of five internally or on the roof, and can be piloted from within the armored shell or from an exposed standing position through the hatch, thanks to special one-way steel mesh armor windows and a control stick that pivots up and down to allow piloting from the standing or seated positions. Product page.